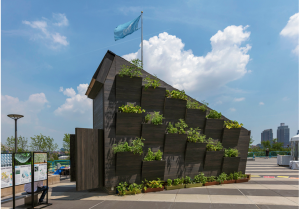 A collaboration between Yale University, Gray Organschi Architecture, and the U.N., the CLT module was designed and built within a breakneck speed of five weeks. The grassy enclave just north of the U.N.’s General Assembly building is no stranger to strange objects: there’s Arnaldo Pomodoro’s enormous, abstract bronze Sphere Within Sphere and Yevgeny Vuchetich titanic Let Us Beat Swords into Plowshares. But recently these sculptures were joined by another curious object: a dark-brown wooden structure, studded with plants and topped by a pitched roof. The Eco Living Module, built to coincide with the United Nations High-Level Political Forum on Sustainable Development, aims to “spark a conversation about how truly self-sufficient a family of four housing can be,” says Anna Dyson, a project collaborator and founding director of Yale’s Center for Ecosystems in Architecture (CEA). The module’s sustainability credentials begin with it’s main architectural material, cross-laminated timber (CLT) spruce, a renewable resource that doubles as a carbon-sink. (Gray Organschi Architecture is a longtime advocate for timber as sustainable material, though the architects are quick to point out that other materials—such as brick or bamboo—are more appropriate to timber-starved regions.) Its CLT panels also feature a thick layer of wood fiber insulation which keeps the interior temperature stable. The large pitched roof, which makes space for an upper-level queen-sized bed, also encourages the stack effect, where hot air from the lower level rises and vents through the roof, and creates a cooling draft.